Housing prices have been surging here of late but experts are sharply divided on what the future holds. Compared with the bleak days of the housing crash, it’s a different housing market today. While the news seems all good, experts are in no agreement as to how long that news will look so Rosy. Shari Olefson, attorney and director of The Carnegie Group think tank, and Ethan Penner, managing partner at Mosaic Real Estate Investors, agree that stricter regulations and tighter credit have brought more stability. It is there, that the two part ways. Appearing on "Squawk Box", Penner said he isn’t worried about a bubble. He admits that housing prices are quite high by historical standards, but that is true for all financial assets. According to Penner, that is due to the Federal Reserve's policies on interest rates more than anything else. Olefson agrees that housing prices have not been this good in a long time. She concurs with Paul Davidson of USA Today that the numbers are indeed good. She points to the S&P/Case-Shiller national home price index that came out last week. S&P/Case-Shiller shows average prices up 5.2% over March of last year. While there is a strong demand for new housing, low supply has also sent prices rocketing. That, in turn, leads to weaker-than-expected home sales. Because of this, Olefson warns of potential bubbles in some markets. When housing price increases outpace wages, she says it’s time to raise a red flag. A quick survey of housing across the country reveals why there is a good deal of disagreement about whether the nation is safe from another crash. Housing is strong in the Northwest but cooling significantly in previously vibrant markets like Charlotte. One of the factors contributing to the volatility of the market is a resurgence of house flipping. Investors are grabbing up properties for cash and that tends to more appealing to sellers. It also leaves mortgage-dependent buyers out in the cold. Great for the seller - bad for the lender. On the flip side of the housing, coin is four-million potential sellers that are underwater with little hope of breaking the surface. According to the property analytics firm, CoreLogic, about 18% of homeowners with a mortgage have garnered less than 20 percent equity. Low equity translates into few sellers. According to Penner, this creates a scenario where speculation becomes much more attractive. He also is not worried about that, "Speculative orientations exist in every market all the time." Olefson counters that the 2008 crash fundamentally changed how Americans think about home ownership. The stigma that most homeowners associated with a foreclosure during the last crisis is all but gone. In 2007, homeowners were unsure of what foreclosure might mean to their credit and home buying future. At that time, said Olefson, "No one knew what a short sale was." But now, the term is familiar vernacular. 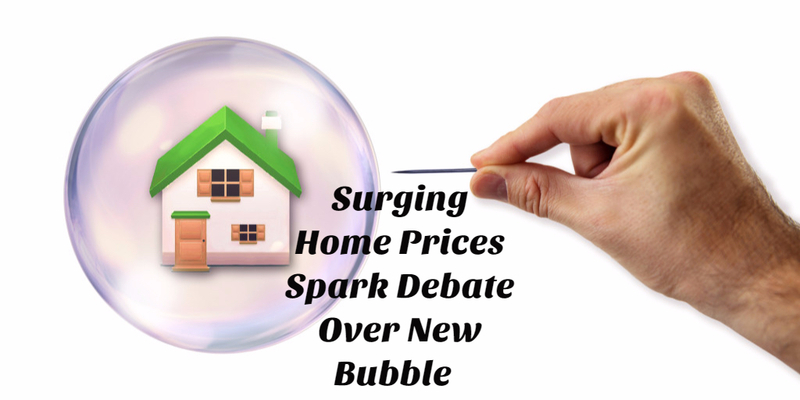 "When Americans start looking at housing as something to speculate on," she said, "that's actually the biggest indicator I think in this modern-day housing world of a bubble." About the author: Jodi Bakst is known for her straight-forward approach to real estate. She has an unparalleled reputation for listening to her clients and delivering results, whether that be in finding the right home for buyers or selling homes.